This is the last blog for our trip to France in 2017. A little sad, but there is next year! Back in the USA. Sandy walks through the Place du Marché aux Légumes her way to the boulangerie each morning. She noticed today that the trees lining each side of the place were full of birds. There was a lot of chirping, singing, etc. She wondered if they were getting together here in France as they do in the USA just before they migrate. We had our final tutoring course with Christine for this year. Sandy has learned a lot from her and she makes learning fun. On the way to Christine’s house we went past a chocolate shop with a funny sign in the window. While we were waiting for the bus to return a delivery truck stopped across the street at the butcher shop. We could see right inside the truck when they opened the doors. Two full size pigs were hanging by their feet inside. They had been skinned and the head removed. Too much visualization for us. Our bus trip to her house and back was uneventful and not crowded. After lunch Sandy organized our prescriptions. She made a list of the kind and quantity of medications left in our apartment. That will make packing for next year a little easier. Today was our final haircut in France. The coiffure is very skilled and we like the way she cuts our hair. We wished her farewell and a good winter. We told her we hoped to see her next year. Sandy shopped for the last time at the marché. She told Monsieur Alix she would see him next year. He will also begin his vacation on Friday. After lunch we returned Sandy’s last book from the library, mailed a letter at the Gare and bought a baguette to have with meatballs for dinner. We sat by the harbor for a while and the temperature was warm. Much too warm to even wear a light jacket. Our final day! Sandy brought home a baguette for breakfast to help us finish the butter. We cleaned, washed clothes, put away, sorted, and finished packing everything we could for today. We took a last walk around the ramparts and spotted a cruise ship in the harbor. It was called Marina. On the ramparts we found a lot of gulls. Sandy had some leftover bread in her pocket so she feed the gulls. While walking the 1 mile around the ramparts, we saw the court. Our friend Alain was not playing today. We did take time to get a picture of ourselves on the ramparts. We called our friend Alain, and emailed other friends to say farewell for this year. We checked our travel plans, train, hotel, airlines, and rental car. Our condo building distributed new door FOBS while we were gone and the old one we brought with us to get back into our building in the USA won’t work. Hopefully, our son left a new one so we could find it. We were up, showered, dressed and walked to the boulangerie for breakfast before 8 am. It was still dark outside and Sandy was glad Phil was with her. We enjoyed delicious baguettes, croissants, orange juice and grande cafe creme for breakfast. We told the boulangere good-bye for the year and we would see her next year. We finished a few things in our apartment and walked to the bus stop. We got on the 9h35 #3 bus to the Gare. We waited just a few minutes, boarded a RER local train and departed. The train made 5 stops in 55 minutes before we arrived at our destination of Rennes. Rennes is a large city and the capital of Brittany. There was a lot of construction at the station and the noise was very loud. We bought a sandwich to eat on the train, waited 55 minutes and boarded the train to CDG in Paris. Our trip was very uneventful. We traveled in 2nd class. The train car and seats were similar to Amtrak. We then took the CDGVAL, which is a tram that runs between Terminals 1, 2, 3 and long-term parking. We reserved a hotel room at the IBIS Styles hotel which is literally between the IBIS and Pullman hotels. It was just a few feet outside of the airport doors in Terminal 3. We had checked in online and our key was waiting. The hotel had been built after 2014. It was a decent sized room for Paris standards, was clean, everything worked and was very convenient. We had dinner in the hotel dining room which was fairly small. There were 3 choices for a meal and 3 choices for a sandwich. We tried to check in online for our flight. We both received messages that said we were unable to check in and needed to see an agent. We didn’t understand this. We were up and eating breakfast just after 6h30. The breakfast was included with our hotel and was fine. The restaurant was busy even at that time. We took the same shuttle from the previous day to Terminal 2A and were ready to get in line to speak to an agent. has many kiosks for self-service check in. There was an agent at the kiosks and Phil explained our need for an agent. He said he would help us at the kiosk. There was no problem checking in and printing a boarding pass. We dropped off our luggage to be checked and headed for TSA. In less than 45 minutes, we checked in, went through border control, TSA, and were headed for our gate. However, we were very early (3 hours before boarding) because we thought we’d have to wait in line a long time to see an agent. We were relieved! It was almost boarding time when they called many names to see an agent – ours included. It seems Sandy was one of the randomly chosen people for extra security screening. We found out that the screening was the reason we couldn’t check in online. When we looked at our boarding passes, Sandy’s had printed on it. Phil’s boarding pass had different letters, none were an S. Sandy and about 20 other people were taken individually, to a spot at the top of the boarding ramp. She was asked to lift up her shirt at the waist to show she didn’t have pockets. She was asked to lift up her pant legs and roll down her socks. She had to open her purse and backpack, take both U.S and French cell phones out and lay them on the table. She and her items were scanned then the scanner was checked on the computer. After passing these measures, she and the other people were not allowed onto the plane or back in the waiting room. They waited about 20 minutes together before boarding the plane ahead of all other passengers. The plane ride home took off on time, was uneventful and landed 40 minutes early. We paid extra for first row of so we would have seats. It was definitely worth it! Phil stretched out his legs completely and there was no one in front of us. The meal that they served was delicious and the snacks were fine. Phil reminded Sandy that the food was prepared in Europe and that may have been the reason they were better to the food served on the way to France. We landed at 13h40 local time which was 20h00 Paris time. We stopped at the Passport kiosk to print our re-entry ticket, waited to go through customs, picked up our luggage, stopped at the border control booth, and were in the rental car shuttle in 35 minutes! We were given a Jeep SUV for the ride back to Holland. The road traffic on a Friday afternoon was bumper to bumper on the tollways, but we had been in worse. Indiana highways were still under construction, but the traffic thinned out in Michigan. We stopped at a McDonald’s for a yogurt parfait, Family Fare grocery store in Holland for breakfast items and were in our condo parking lot by 20h00. We were exhausted after being awake for 20 hours. As soon as we put the clean sheets on our bed and unpacked necessary items we were in bed. It was a relief to be back. We both slept fairly well. The 6 hour time difference between Michigan and France is difficult. The eating and sleeping schedules are awkward. We returned the rental car and stopped at the grocery store for fruit and a few more food items. We took it easy and rested or napped a bit. We both still felt like our bodies were in motion. Wednesday June 1 is the day for haircuts. This morning we awoke to a lot of noise outside. We knew the city workers were returning to continue work on the street because we’d seen the no-parking signs. When we looked out the window today there were 2 or 3 workers and several machines. It was very noisy and our building was vibrating. Our street with part of the old surface removed. Asphalt truck with a worker wheeling some asphalt around the corner. We stayed in our apartment and completed homework for our tutoring session tomorrow with Christine. After lunch we went out to walk to our haircuts. We were supposed to have our haircut last week, but we had postponed the haircuts till this week. We had postponed the haircuts because we expected to be in Normandy. Instead we had stayed home to take care of Sandy’s infected foot. Because we had delayed the haircuts for a week we were both overdue and glad to have our haircut. On the way to the coiffure we walked on the high street and saw the new flower planters hanging from the buildings. Flower planters on the high street. Construction workers finished working for the day around 16:30. They’ll return tomorrow to asphalt the area in front of our building. Asphalt is so much better than mud! It was cloudy and cool all day with a high temperature of 15 C.
Tuesday April 19 is another very sunny day, but today it is getting quite a bit warmer in the afternoon. Haircuts, French lessons and a visit to the dentist are on the agenda. Our 9:00 AM haircut appointments have us up and going early. This is our second visit to this haircut shop this year. We went quite a few times in 2014 with good results. The same thing applies this year. We get really good haircuts and they are consistent, which is important. The name of the shop is GOMINA Coiffure . We left the haircut shop at 9:30, just a little behind our normal schedule. So we hurried to the esplanade Saint-Vincent to get the bus on our way to our French lesson. We just made it to the bus, mainly because the woman bus driver was nice enough to wait for us. We changed buses at the gare and got to our tutor Christine’s house at 1 minute to 10. Christine had her dining room table back in place after having it repaired last week. So the French lesson was a success. Sandy had to do a lot of speaking today and she is getting better every week. We left Christine’s hours at 11:55 and caught our bus at 12:05 as planned. When we got to the gare / train station, we went to the SCNF ticket counter to buy our tickets for our Friday trip to Rennes. We got back to the apartment around 12:45 and had a nice lunch. Phil had a ham sandwich and Sandy had soup due to her tooth problem. At 14:00 Phil went up to the 4th floor to visit with our neighbor Jean. In the mean time Sandy worked on writing her thoughts for her visit to the dentist. She wrote the thoughts out in French so she could share them with the dentist. There is no guarantee he/she knows any English and Phil’s French will only get her so far. Sandy also took a quick trip to the Carrefour city to buy a couple of items. A couple of minutes after her return, we got a phone call from the dentist’s office asking if we could get to the office as quickly as possible. They must have had a cancellation. We tried hard to get there as quickly as possible, but we missed our bus at the esplanade Saint-Vincent and lost about 15 minutes. We took our bus as planned, but we knew we had to walk for about 8 minutes to the dentist’s office. Unfortunately we missed the office and walked past it. Phil saw a man sitting on his front porch and asked the man for directions. He pointed us in the right direction. Merci monsieur! The dentist’s office was pretty much a normal office. The assistant who took our appointment call yesterday greeted us and Phil thanked her for being so helpful in setting up the appointment. We waited in the waiting room for about 5 minutes, then the dentist came to get us and take us to his office. The dentist’s office has 3 dentists and 2 dental assistants. In our previous dentist’s office in Springfield Illinois, there was 1 dentist and 4 assistants. Sandy gave her written thoughts to the dentist. He read them and then escorted her to the dental chair which was in his office. He took a look at her broken tooth and gave his diagnosis. He did not think the tooth needed a crown. Rather he suggested using a resin like material to repair the remaining part of the tooth. That was great with Sandy. He suggested doing it right then and Sandy gave her okay. About 40 minutes later we walked out of the dentist’s office with Sandy having a newly repaired tooth. Things could not have worked out better for her. At a later date we’ll write-up a blog entry to discuss our dentist and doctor appointments, how we set them up, how much they cost, and our take on medical issues in France. provide entertainment for people coming to take a look at the boats. One of the boats is captained by a man from Japan. He is the first Japanese sailor to participate in the race. His name is Hiroshi Kitada and his boat is called the KIHO. We then resumed our walk back to the apartment. On the way we passed the boules courts by the wall. 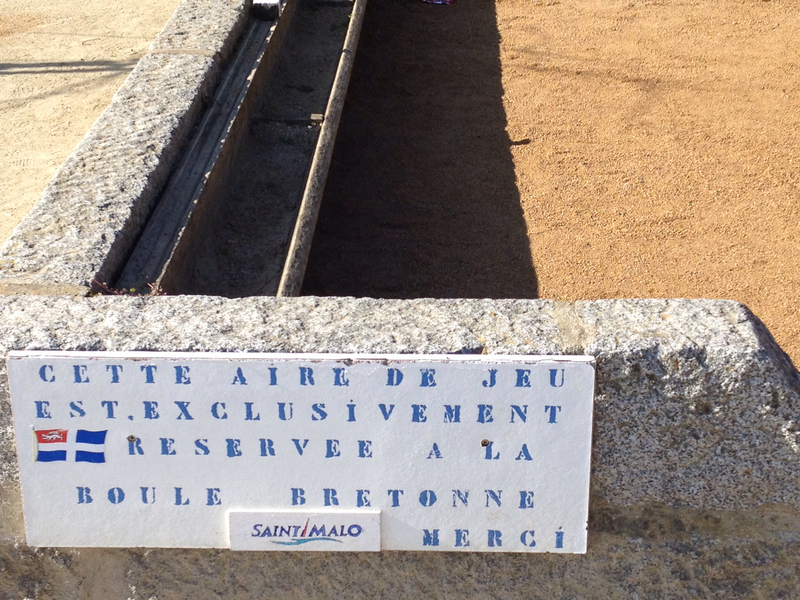 The group responsible for the boules courts had worked on the courts to get them ready for the summer. The courts had new gravel on them and they looked good. 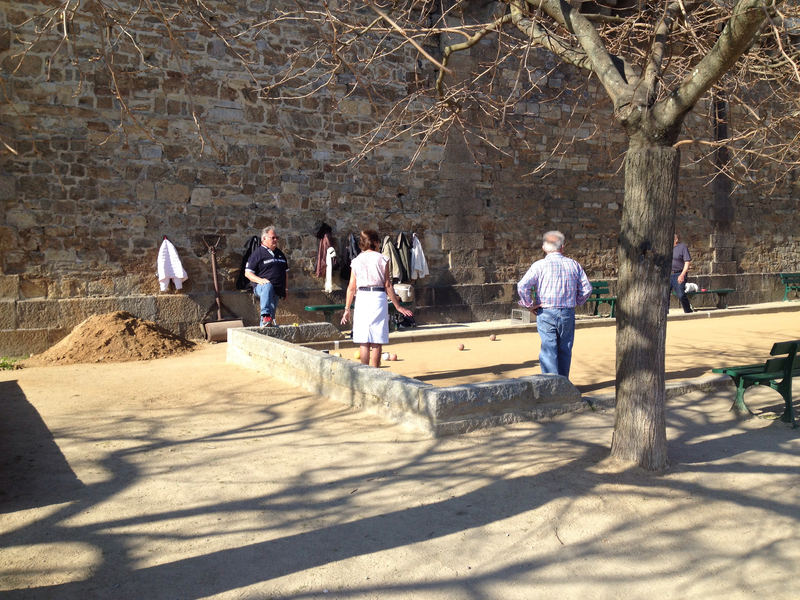 The group was playing boules, trying out the newly refurbished courts.